Google has done a stunning job of providing a unique photo montage of the UK street scene, with its photo vans touring the streets of the UK. But what about the railways? Here is a modest attempt to show some of the railway lines of the UK using Google Streetview. The first line mapped is the Liverpool-Southport line in Merseyside. This uses the Lancashire & Yorkshire Railway convention of Up and Down, and makes the journey in the Up direction towards Liverpool. Each 'view' is in the Up direction, the idea being that the Google navigation tool allows the Down direction to be viewed in the same window. There are some exceptions, where the opposite view is of greater interest. As it takes a few seconds for each of the Google maps to be retrieved, the line is broken into sections, and generally these are station-to-station. Manchester Victoria with 44818, 44884 & 44781 on 10 May 1968. This was the magic of Victoria, right at the heart of the old Lancashire & Yorkshire Railway system. As a young boy I cherish the memories and am grateful for having lived in the north west at the end of steam. Modernisation is represented by a Metro-Cammell Class 101 dmu on the the through road, whilst a Class 104 sits at the platform which connected with the LNWR's Exchange Station next door, and so formed the longest platform in the country. It is only relatively recently that it occurred to me that this might be turned round. 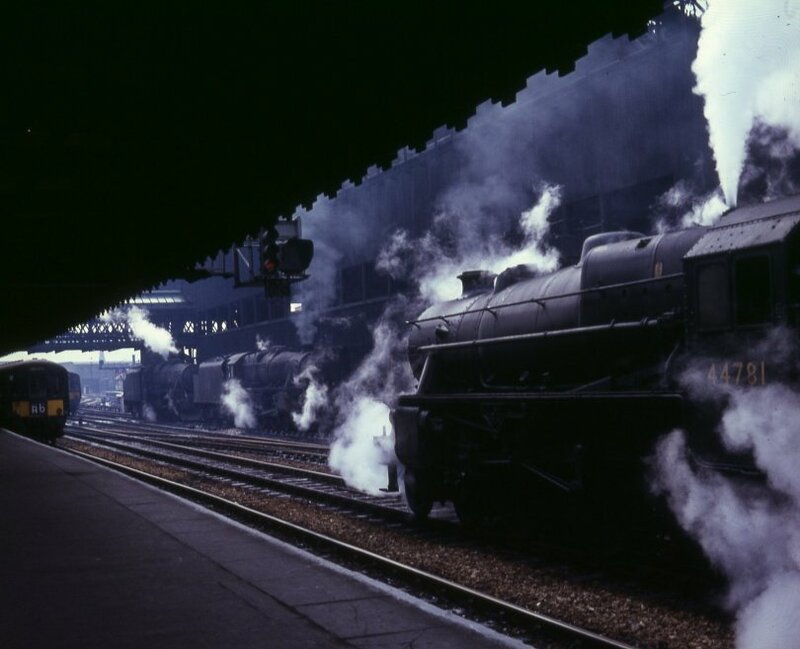 Rather than British Railways favouring the old Lanky system with the end of steam, in actual fact it was the last division of the national system to be modernised. Two thirds of the last active locomotive sheds were Lanky, namely Lostock Hall and Rose Grove. The other shed was the L&NWR's Carnforth. By the time this photograph was taken, the only Lanky sheds still open were Lostock Hall and Rose Grove, along with Bolton and Newton Heath. These last two were to close on 30 June 1968 and 1 July 1968 respectively. There had been a reprieve from further closures after Low Moor closed on 2 October 1967. Wakefield and Aintree had closed on 3 and 12 June 1967 respectively.